I think that’s a fair definition. I also think that it is interesting (and somewhat amusing) how this definition ropes in, both, Christians wanting to shed the ‘religious tag’ and die-hard atheists. As much as I want to distance myself from the aspects of religion which I find distasteful, I doubt that I can altogether deny that I am in some sense ‘religious’. The central issue, probably for most of us, is the manner in which religion is expressed. I would contend that it is here where the divide occurs. In terms of manner, and emphasis, there is a spectrum between highly organized, duty-oriented, religion on the one hand and highly informal, relationship-oriented, religion on the other hand. The reason I entitled my Sunday message from Sept. 21, ‘The Alternative To Religion’ wasn’t so I could join the fray of those wishing extinguish every hint of religion; it was, rather, to clearly align myself with the highly relational side of Christianity. The Christian life involves duty, no doubt. There are rules, parameters and boundaries to guide my personal conduct. But this, in my opinion, is not where we begin as Christians. We begin as followers of Jesus Christ. The entry point to Christianity is not by way of a morality exam. We enter by positively responding to the invitation, “Follow Me” (Mk. 1:17), “Come to Me” (Mt. 11:28). Christianity begins as a relationship with Jesus. The relational aspect is central. The relational aspect comes first. That doesn’t mean we disregard issues relating to our moral conduct, it just means that one comes before the other. For example, there are many boundaries and parameters which exist to safeguard my marriage. I also have so pretty clear duties and obligations to fulfill as a husband. However, my marriage does not centre around these duties and parameters; my marriage centres around my wife. She is my focus. Accordingly, it is my love for her and my desire for her well-being which motivates the fulfillment of these obligations of duties. ‘I’m doing this because I love you and want to spend time with you.’ ? The first answer may be technically true, but it’s not the honouring answer. The second answer honours by prioritizing the relationship above over duty. This is what I see in the New Testament. The transformation of our passions, our worldview, and our conduct does not occur because we devote ourselves to a new moral code. The transformation occurs as the natural fruit of being singularly devoted to Jesus Christ. This is where our focus should lie. The alternative to devoting oneself to religion is devoting oneself to Jesus in a highly relational way. Have a listen to the audio below. I’d love to read your feedback. Anyone who flies knows the emergency plan routine: When the oxygen masks deploy, take for yourself before you help another. At first hearing, this instruction seems selfish; it seems tantamount to jumping to the front of the dessert line. Upon further reflection, however, the instruction makes perfect sense. If we are in a compromised state we will be in no condition to help anyone. As the summer of 2008 began, I felt myself ‘running out of gas’. We were furiously planning for the launch of The Well, our Vacation Bible School was being planned and executed, and we had as many as five of our members in hospital. This was on top of all of the normal duties and expectations for ministry. I am grateful that as I became increasingly less useful (in a ministry sense), my self-awareness became more acute. My longing for the fellowship of Jesus Christ intensified. So did my hunger for reading Scripture and for prayer. I desperately needed renewal and refreshment…I begged God for that…and He delivered. I realize that I have only been ‘back on the job’ for three weeks now, but I still find that my energy level is somewhere between the Energizer Bunny and the Tasmanian Devil. But it’s so much more than just energy levels (although, if I could bottle how I feel, I could probably put Red Bull out of business!). My perspective even seems sharper. And my hunger for Christ remains, even while feeling the satisfaction of His grace. I share this because I’m guessing there might some who are feeling today, what I was feeling in mid July. You’re being pulled in a hundred directions. Your ‘To-Do’ list is getting bigger, not smaller. You’re not reading your Bible as much. You’re too tired to pray. You’re unmotivated to attend and serve your local congregation. You’re ready to tap out. It is likely the case that someone depends upon you in some significant way. It is likely that your Christian leadership sets the pace for someone–perhaps it sets the pace for a group of people. How can you do that effectively if you are ready to ‘tap out’? How can you build up another, if you have been brought low? Don’t allow your myriad of responsibilities to keep you from making the call. This coming January will mark my 11th anniversary as an ordained minister. It has been a hugely satisfying experience and I can scarcely imagine doing anything else. Ministry, as you can likely imagine, also has numerous challenges. Ministry is not easy. As I say that, I see many parallels with our life as a Christian. Those who have chosen to follow Jesus Christ have not been left wanting. And yet, we who aspire to follow in the steps of our Saviour will readily admit that the road is not at all easy. I’ve been encouraging those attending St. Giles Kingsway and The Well over the last couple of weeks to not over think what it means to be a Christian. The mandate for the Christian is not complex. It is actually quite simple. Jesus calls us, “Follow Me” (Mark 1:17). Everything the Christian needs to do falls under the umbrella of those two words. Now, in saying that the mandate for the Christian is simple, I wouldn’t want anyone to think that I’m saying that the mandate is easy. Following Christ is certainly not easy. Christ does not call us to easy things, but to things that are extremely difficult. Jesus says that the person who is angry is in danger of Divine judgment (Matthew 5:22). He also says that the man who looks at a woman lustfully “has already committed adultery in his heart” (Matthew 5:28). Jesus challenges us to “turn the other cheek” when harmed (Matthew 5:39), and then He expands the exhortation by requiring that we “love our enemies” (Matthew 5:44). Yes, following Jesus is extremely difficult! With that being said, I’d like to offer you two words of encouragement. First, your getting into heaven does not depend upon your ability to obey God’s commands (Romans 3:28). Your performance does not affect your standing. Secondly, Jesus will help you to do that which He requires (Matthew 11:28-30). We are not alone on this journey. We have help. Moreover, one of the key points of the Christian Gospel is that Jesus has met the Divine standard on our behalf (Romans 3:21-25). Recognizing this frees a person from trying to earn God’s favour, and leads us to follow Christ motivated by love and gratitude. That’s the track I want to be on. I know I’ll never be ‘good enough’ for God by depending upon my own moral fitness. But I am eager to honour Him, and so I determine to follow closely, no matter how difficult the road ahead may be. Thankfully, I have help. I have a relationship with a strong Saviour. This is what we were designed for. Have a listen to the message below, ‘Simply Difficult’, delivered on Sunday, September 14, 2008. I have been both thrilled and humbled by the response to last Sunday’s launch of The Well. Yesterday, this blog recorded a record number of visits. Additionally, I received many emails, facebook messages and wall posts from folks who have been tracking this new initiative. I am so grateful for your encouragement and support! Do you live in Greater Toronto Area? 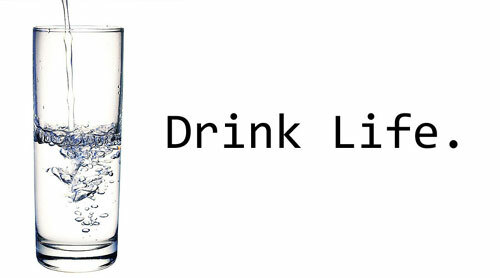 If you do, we invite you to come and have a drink at The Well! Anyone who has been tracking this blog knows that today was the launch of a new initiative, The Well. Undoubtedly my perspective is biased, but from my vantage point, the launch was a homerun. You could say that The Well is the sum of 5 parts: (in no particular order) 1) the physical environment (our Sports Hall got a total makeover for this, and Aaron Merkle has already mastered the video slides ), 2) hospitality (parking / hosts / ‘Coffee Corner’ / BBQ team), 3) children’s ministry (known as ‘Quench’, led by Diana Loach), 4) music ministry (led by Cliff Cline on acoustic guitar and vocals, Ric Jacka (keyboard), and two teenagers who were awesome on bass guitar and drums), and 5) the message (you can listen to it at the bottom of this post). I have great difficulty evaluating what I did, but I can confidently say that the other four areas totally rocked! It is hard to describe the level of satisfaction I feel following a successful launch as I consider all of the time, money, and effort that so many have invested to make The Well possible. From all accounts, God was glorified and the people gathered were encouraged and blessed. One father proudly reported how his 12 year-old daughter leaned over in the middle of the service to tell him, ‘I like The Well’. That simple statement made a father’s day and reaffirmed for this pastor the importance of this type of ministry. Attendance was solid; in a room that seats 140, I’d say we were 85% full. I realize that some of the folks in attendance today were there to support the launch and might not be with us regularly. I heard from a few families who intend on coming, but couldn’t make it today. I’m guessing there was also a group of people who came at the invitation of friends/family who might be open to the prospect of returning. I sincerely hope and pray that many of the folks we saw today will be with us again as we seek to better understand what it means to be a Christian in the 21st Century. Our current message series is entitled, ‘The Road With Jesus’ and today’s message was titled ‘Keep It Simple’. My hope is that we communicated through the message, the music, and our hospitality that Jesus is worth following, and that prioritizing a relationship with Him is what we were all designed for…it will satisfy us like nothing else. Have a listen to today’s message; I’d be pleased to read your feedback. If you attended today’s launch, I’m eager to hear your impressions.